When building a new home, a detail that is often overlooked is the stair railings. But they are a very important element of the home, essential to travelling from level to level. Often these exterior deck stairs will lead to the backyard. This area can sometimes be manicured into a courtyard or landscaped with plants and bushes. Deck stairs railing comes in many different forms. The most basic stair handrail, seen on just about every house, is made with pressure treated lumber with 2×2 pickets running straight up and down. The visual effect of this look is equivalent to bars on a window. 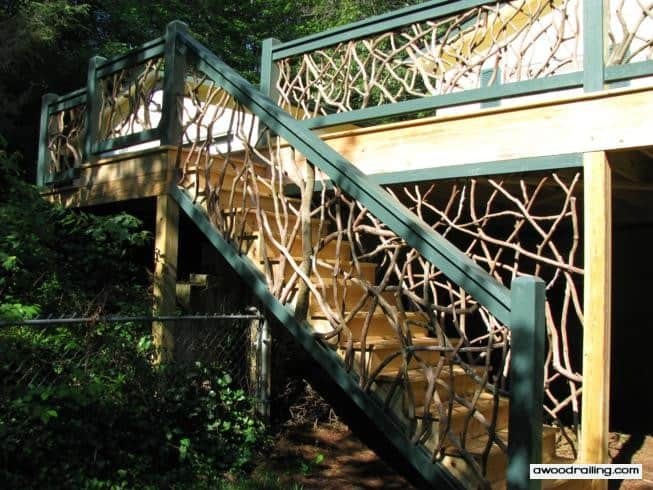 This pattern really does nothing to enhance the view from your deck or the way it appears to onlookers. There are some interesting geometric patterns that can be made with lumber. But no square shape can compare to the rustic beauty of the organic and wondrous forms made by woven branches. 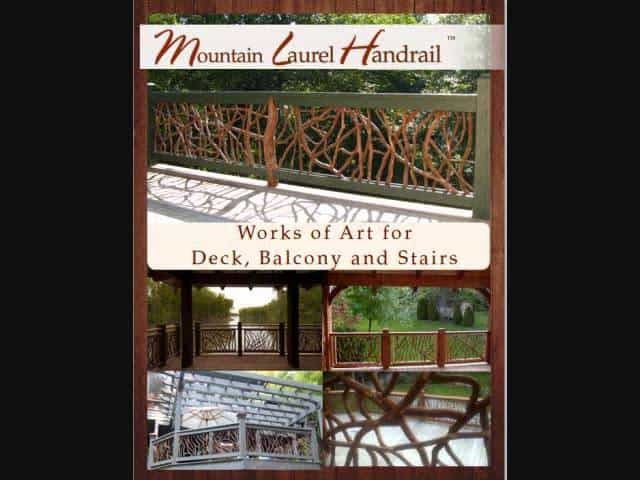 Mountain Laurel Handrails are crafted by skilled carpenters versed in combining disparate pieces into a cohesive whole. The sections arrive as an easy to install railing kit. Sections are built to custom measurements and each order is unique. When they arrive, simply trim the ends of the sections and slide them into place. Screws are the suggested fastener for securing the top and bottom rail to the posts. These endow any home with incomparable and utterly unique works of art! Many homes feature a grand staircase as the focal point of a great room. And oftentimes these stairs are finished with precise woodworking. 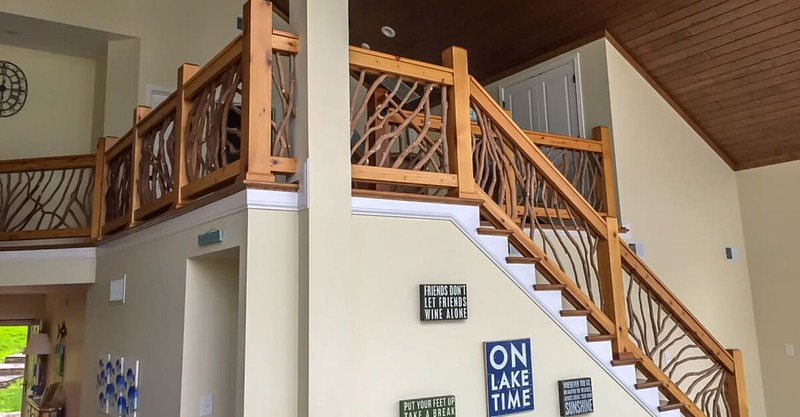 But too often, the handrail for stairs gets overlooked and the balusters end up as boring pickets or turned spindles going up and down from tread to banister. 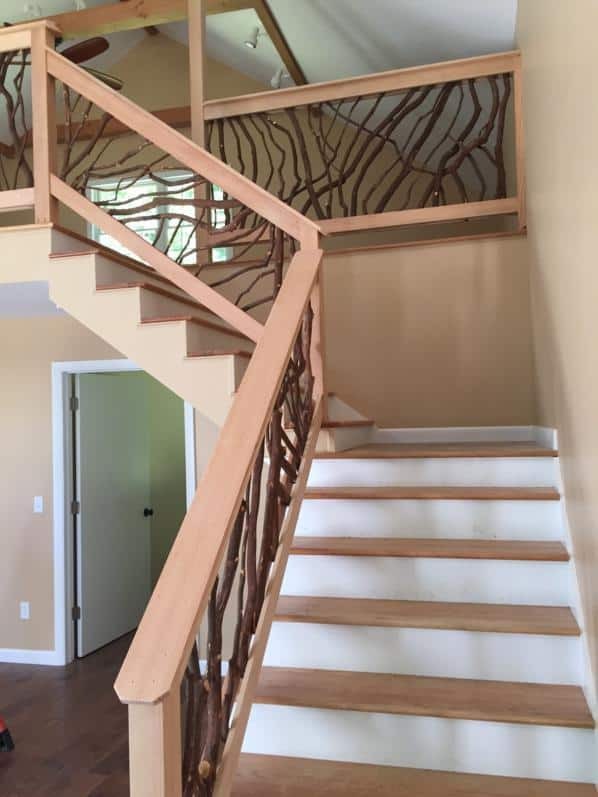 A thoughtful staircase design acknowledges that an intricate and beautiful balustrade is the most important factor in the look of a stairway. A truly magnificent staircase begins like any other, with a well-planned design especially for the stair railings which is often the most visible part. The overall style of the home is the first consideration. Some modern architecture calls for glass balusters and floating treads, while some old-world or Tuscan designs might be better served with wrought iron. 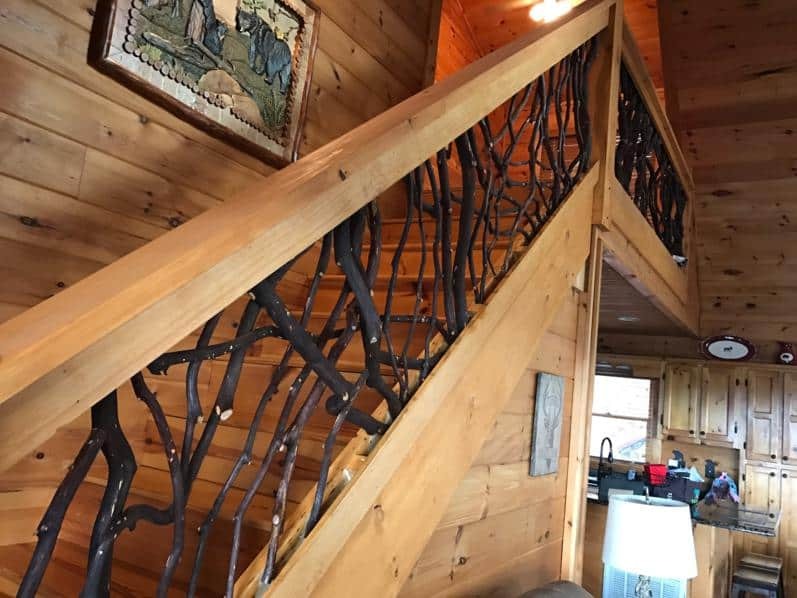 But for log home, timber frame and other rustic and mountain styled buildings, there is no better choice than Mountain Laurel Handrails. 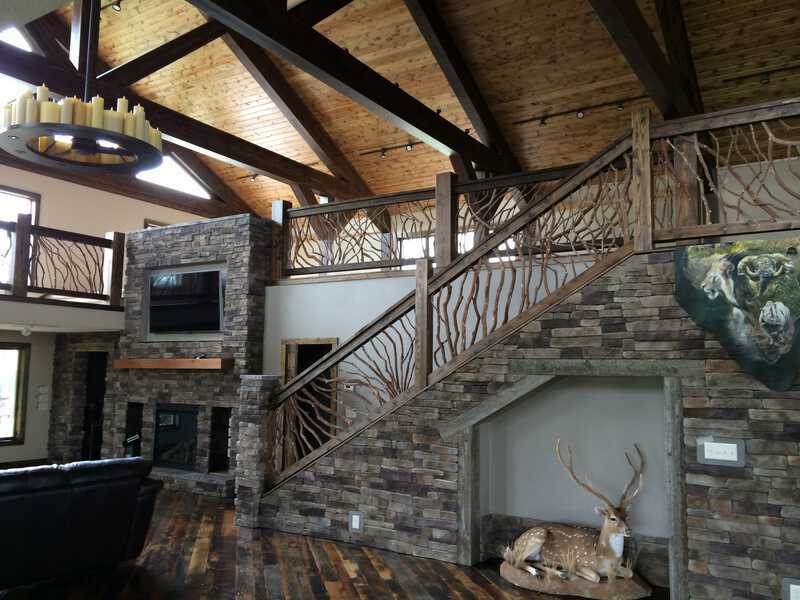 They are custom-built and can be modified to match any staircase design although they are especially suited for stair parts, treads, and risers made of woods like oak, hickory, bamboo or reclaimed wood like heart pine. 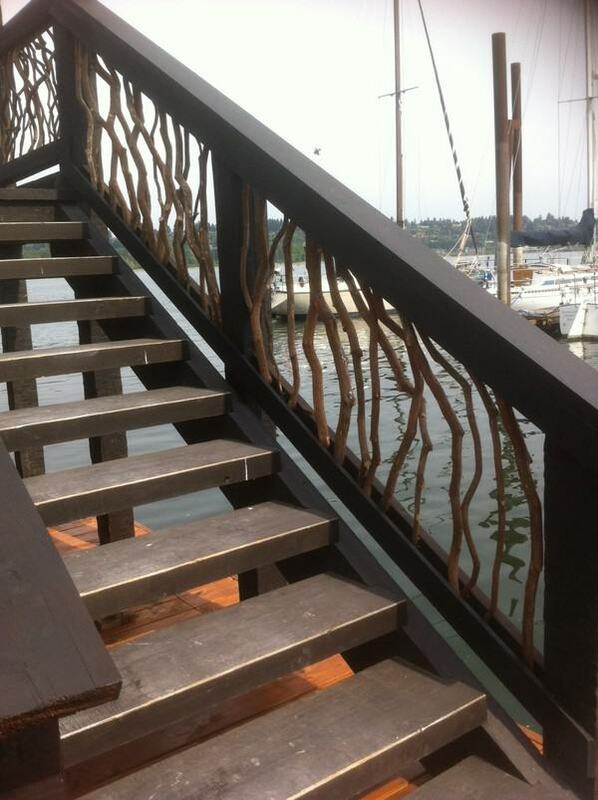 After a wood species is chosen for treads, riser, and skirt board, the staircase design can move on to architectural aspects including trim details and the handrails for stairs. Each section is an elaborate trim detail in and of itself a testament to nature’s beauty crafted by a skilled artisan. 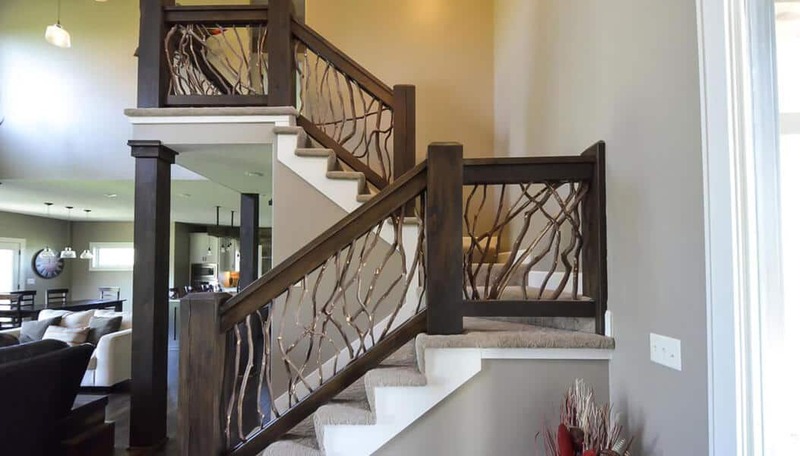 These unique stair railing designs accents the grandeur of any home and give your visitors something to talk about!